shelters until they are adopted. 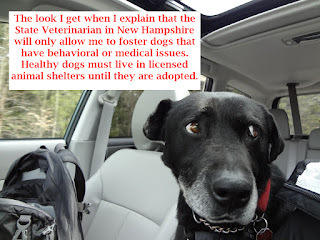 Since fostering healthy, adoptable dogs in the State of New Hampshire is now illegal, I wanted to learn how I could go about opening my home temporarily to a homeless dog in need of medical or behavioral care. I am not a veterinarian, but I do have experience in caring for dogs with special needs. My own dogs, who lived to the ages of 15 and 16, required a lot of attention in the last years of their lives from various medications and supplements to assistance with limited mobility and frequent visits to the veterinarian. (a) License holders shall assure that foster facilities at which the license holder keeps animals are inspected no less frequently than once a year and that they meet acceptable standards to ensure that the health and safety of the animals are maintained. (b) Foster facilities shall be used solely for medical or behavioral rehabilitation when a premises already holds a license to house animals. Foster facilities shall not be used as an extension of space for housing the general population of a licensee. (c) Foster facilities may house animals that are owned by the licensee, but foster facilities shall not own such animals. If the department receives a complaint about a foster facility, the department shall inspect that property as part of the license holder’s network and the license holder shall be subject to sanction for any shortcomings which pose a risk to the health and safety of the animals in their network. (d) Licensees shall maintain a list of current foster facilities that shall be available to the department upon request. (e) Brokers shall not use foster facilities. I am not a lawyer, so the following discussion is not legal advice but rather my own personal viewpoint as a citizen of New Hampshire about how nonsensical these rules are and how they will serve only to increase the number of underground, unregulated transfers of animals that are a threat to the safety of people and animals in the State of New Hampshire. Legislative changes must be made for a reason and the outcome of such changes need to be measureable in order to ensure that we do not have unintended consequences. These rules were made without reference to data that justified the need for them and without a description of how these changes will be measured for effectiveness. (a) I do not object to having my home inspected by a licensee so that a rescue organization can be assured that my home is safe. Reputable rescue organizations inspect foster homes, and many of them also require a home visit before an animal is placed for adoption with a new family. (b) I think I should be allowed to open my home to a healthy dog that is simply in need of a place to live temporarily. Why should only dogs with medical or behavioral issues get to reside in a foster home? That does not make any sense whatsoever. (c) I do not wish to be considered the owner of the foster dog, but I will certainly treat it as well as I would one of my own dogs. However, I am not opening my home up to inspection by the State Veterinarian. If someone wishes to file a complaint about how I am caring for an animal, he or she can call the police and initiate an animal cruelty investigation. (d) I object to having my personal details disclosed to the State Veterinarian. Again, call the police and file a complaint about suspected animal cruelty. That is why we have animal cruelty officers on police departments. If an animal is being mistreated, you do not need to investigate whether it is owned, stray, fostered or otherwise, call the police and report the facts of the situation that you suspect is cruel or neglectful. Reputable rescue organizations have foster agreements that outline the requirements of foster care and allow the organization to reclaim an animal from a foster facility. (e) I object to brokers not being able to use foster facilities. 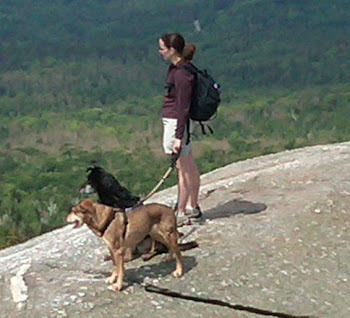 There are numerous, well run not for profit rescue organizations that do not have physical shelters based in New Hampshire that should be able to place animals in our state temporarily in foster homes while adopters are located or adoptions are finalized and also to serve as a critical safety net for owner surrendered animals as well as for failed adoptions. Rescues are run by volunteers who most often work full-time jobs and are trying to help animals that would otherwise be killed for space. I do not think these volunteers should be required to open their personal homes up for inspection and licensing as animal shelters when they are placing animals that are fully vaccinated, receive heartworm preventative, and are placed for adoption with health certificates. I am not opposed to animal shelters, and I have adopted directly from animal shelters in the past. I am also not opposed to responsible breeders, and I support a person's right to purchase and own a purebred dog. I am absolutely opposed to legislating a situation and making it worse when the proper way to address it is through educating people and making it better! If you agree, please let the State Veterinarian as well as your State Senators and State Representatives know by contacting them directly. Why does NH even need a State Vet anyway??? I'll bet his job description is solely to count cows and harass legitimate rescue groups!! How do we get rid of HIM? ?